A programmer, computer programmer, developer, dev, coder, or software engineer is a person who writes computer software. The term computer programmer can refer to a specialist in one area of computer programming or to a generalist who writes code for many kinds of software. One who practices or professes a formal approach to programming may also be known as a programmer analyst. A programmer's primary computer language is often prefixed to these titles, and those who work in a Web environment often prefix their titles with Web. 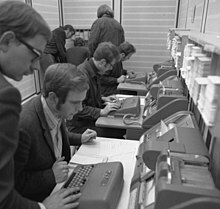 The term programmer can be used to refer to a software developer, Web developer, mobile applications developer, embedded firmware developer, software engineer, computer scientist, or software analyst. However, members of these professions possess other software engineering skills, beyond programming; for this reason, the term programmer, or code monkey, is sometimes considered an insulting or derogatory oversimplification of these other professions. This has sparked much debate amongst developers, analysts, computer scientists, programmers, and outsiders who continue to be puzzled at the subtle differences in the definitions of these occupations. A programmer, computer programmer, developer, dev, coder, or software engineer is a person who writes computer software. The term computer programmer can refer to a specialist in one area of computer programming or to a generalist who writes code for many kinds of software. One who practices or professes a formal approach to programming may also be known as a programmer analyst. A programmer's primary computer language (Assembly, COBOL, C, C++, C#, Java, Lisp, Python, etc.) is often prefixed to these titles, and those who work in a Web environment often prefix their titles with Web. The term programmer can be used to refer to a software developer, Web developer, mobile applications developer, embedded firmware developer, software engineer, computer scientist, or software analyst. However, members of these professions possess other software engineering skills, beyond programming; for this reason, the term programmer, or code monkey, is sometimes considered an insulting or derogatory oversimplification of these other professions. This has sparked much debate amongst developers, analysts, computer scientists, programmers, and outsiders who continue to be puzzled at the subtle differences in the definitions of these occupations.